The Mozaic Platform is bursting with reporting because good feedback is essential to positive and sustained growth. Here are the major reporting tools and locations followed by some suggestions for even more data analysis. There are many many ways to report website data - google made a whole division out of just analytics. We include google analytics inside your WordPress dashboard to make that information convenient. If a website has e-commerce (woocommerce) there is reporting in the dashboard for that as well. In the screenshot below, you can see the Google statistics on the left (blank as it has not been set up) and the woocommerce statistics on the right. 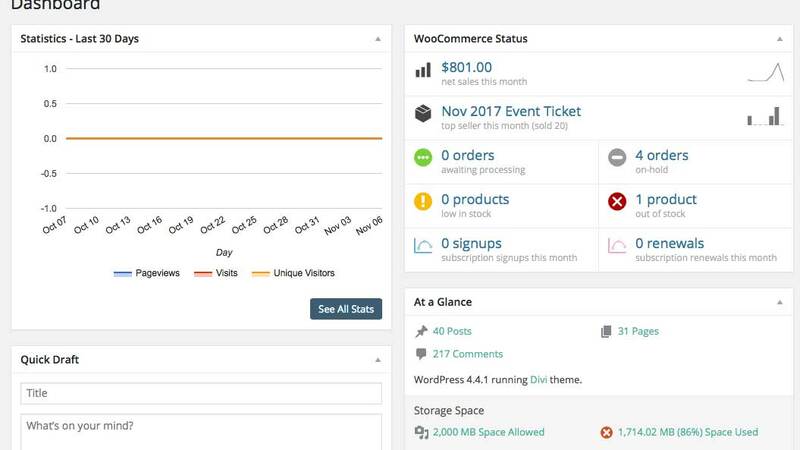 Other reporting in the dashboard includes form submissions, and WordPress default reporting on website statistics such as the number of pages and posts you have, comments and comment moderation, and security. Inside your Mozaic portal is more reporting. 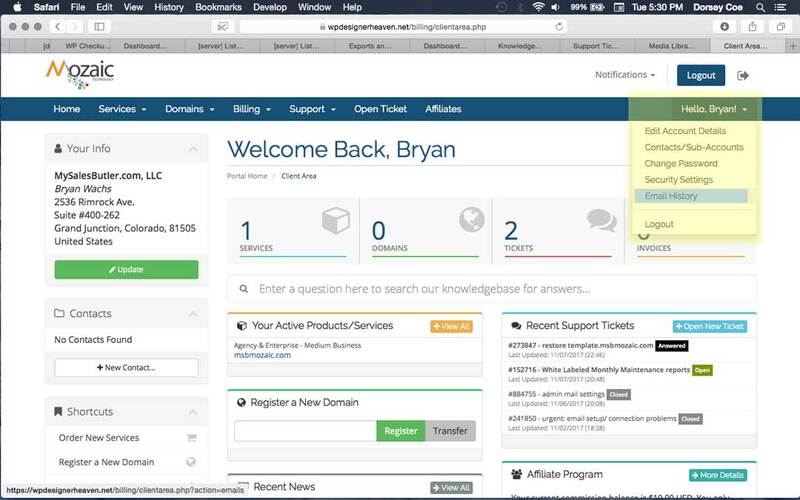 As the screenshot below shows; there are 4 quick links to your services, domains, support tickets, and invoices. Below the quick link buttons you see short summary reports of; active products, recent support tickets, affilliate program payouts, and Mozaic news and updates. One of my favorite parts of the portal is the email history, located under the client name at the top right of the page (see screenshot). 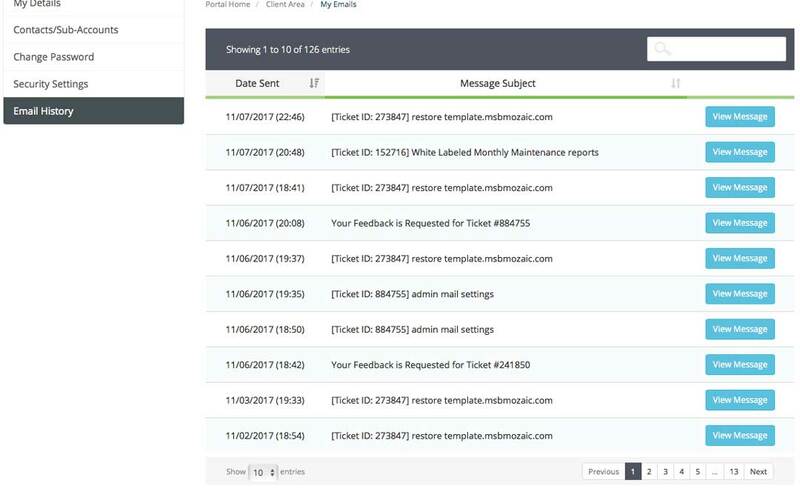 The account shown in the screenshot below has about 130 emails archived including support questions, invoices, payment receipts, password resets, anything you've communicated to and from us in the portal! 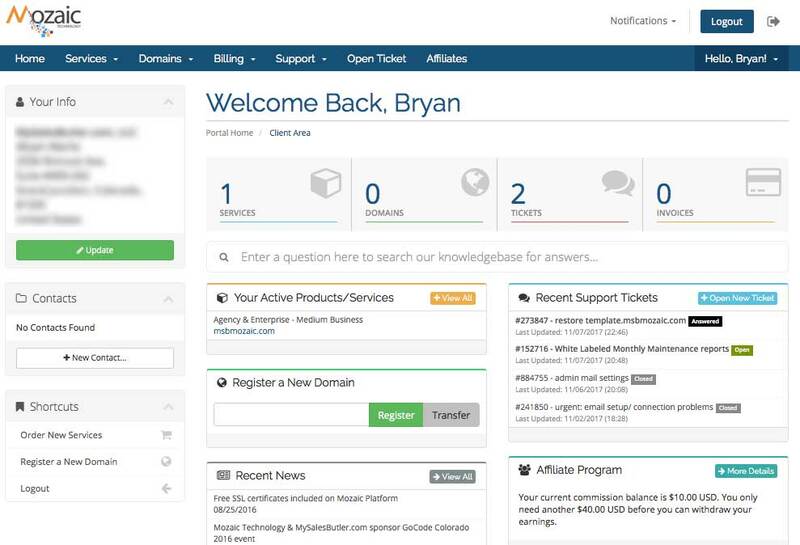 The next area for extensive reporting is cPanel. cPanel is where you configure many of your server options like domain names, emails, software installs, and much more but for this KB article we are looking at cPAnel reporting. There is a great deal of dashbpoard at-a-glance reporting down the right side of cPanel including; Primary Domain, Home Directory, Last Login, Addon Domains, Aliases, autoresponders, aliases, disk space usage, bandwidth usage, and so on. 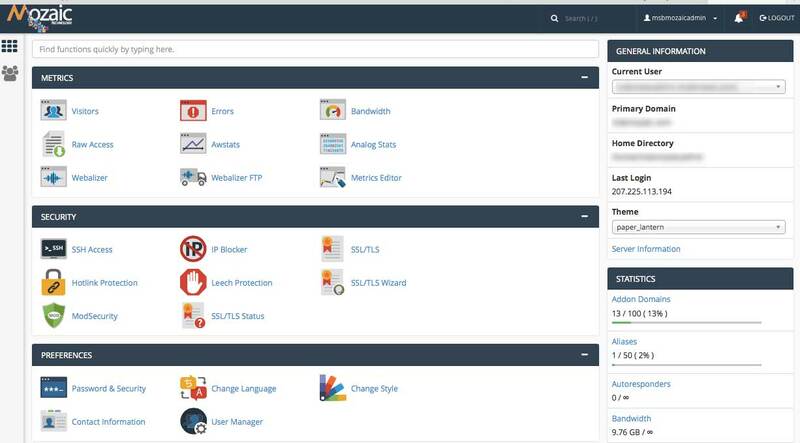 In the main section of cPanel under the metrics section is more data reporting than most people would care for but cPanel knows this information is critical to IT departments, developers, administrators and support. In the security section you can see a report of all your active ssl certificates under SSL/TLS Status. 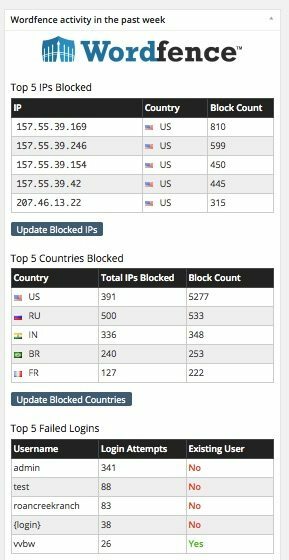 There is so much reporting in cPanel that it could easily be a seperate KB article. At the very bottom of this article I included the report from the Analog Stats icon in the metrics section, so you can see just how detailed the reports can be. I want to touch on a few other reports generated by various tools that we find useful. First, in our smush plugin it reports the amount of file size savings shaved off the images that have been uploaded to your site. The reason this is important is that file size is directly related to load time - the smaller the images file sizes the faster the site loads! Second, caching plugins like Hummingbird monitor your site for areas of improvement to site speed and report what and where you can adjust settings to increase performance. Third, SEO reports. In addition to the yoast plugin displaying SEO quality, readability, and indexing, we have external tools like "Site Audit" This tool attempts to do a quick assessment of any website you give it, sending the report to the email of your choice. It's a great way to get an overall view of how well your website (or your competitors) is doing in regards to SEO. There are still more options! Why you might ask? Some companies make a living by doing nothing but reports. They specialize in customizing the report so that it includes the data you find most helpful, while excluding the piles of less helpful data that could obscure or confuse the reader. These services are actually really handy, creating customized reports that are white labelled to your organization for you to disseminate to your clients on a weekly or monthly basis. Some clients love this information and read everyword, other clients only browse the headlines and are happy knowing you are working in the background to keep their website up and running. Depending on the size of your organization, pay reporting services can cost thousands of dollars a month. But wait, you can implement custom reporting for your clients very easily and inexpensively with the help of a few plugins. They have many features for Agencies and designers who have multiple websites, including reporting. Looking for a specific type of reporting? Contact us, we'd be happy to offer some solutions and help! Program started on Wed, Nov 08 2017 at 6:11 AM. Analyzed requests from Mon, Dec 12 2016 at 4:53 PM to Wed, Nov 08 2017 at 5:10 AM (330.51 days). Figures in parentheses refer to the 7-day period ending Nov 08 2017 at 6:11 AM. Busiest month: Mar 2017 (278 requests for pages).